Necessary Trouble is American history at its freshest and most compelling. 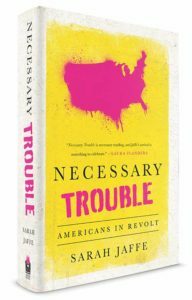 Necessary Trouble is the definitive book on the movements that are poised to permanently remake American politics. We are witnessing a moment of unprecedented political turmoil and social activism. Over the last few years we’ve seen the growth of the Tea Party, a twenty-first-century black freedom struggle with BlackLivesMatter, Occupy Wall Street, and the grassroots networks supporting presidential candidates in defiance of the traditional party elites. In Necessary Trouble, journalist Sarah Jaffe leads readers into the heart of these movements, explaining what has made ordinary Americans become activists. As Jaffe argues, the financial crisis in 2008 was the spark, the moment that crystallized that something was wrong. For years, Jaffe crisscrossed the country, asking people what they were angry about, and what they were doing to take power back. She attended a people’s assembly in a church gymnasium in Ferguson, Missouri; walked a picket line at an Atlanta Burger King; rode a bus from New York to Ohio with student organizers; and went door-to-door in Queens days after Hurricane Sandy.